Just a short walk to the beach and across the street from South Beach Marina. This warm and cozy 4 bedroom, 3 bath Beachside Home will not disappoint. On the first level, you'll find a large great room that encompasses the kitchen, dining room and living room complete with new 47 inch flat screen TV. The fully stocked kitchen has all stainless steel appliances. The dining area, between the kitchen and living room, seats 8. Off the living room is a large screened porch and a sun deck where you can enjoy a relaxing evening outside. Also located on this level are 2 bedrooms and 2 full baths. On the second level there are 2 more bedrooms and 1 bath. This home’s South Beach location and layout make for a great vacation home. •	Pet friendly. $300 Pet Fee. Please call our office to inquire about our pet policy. 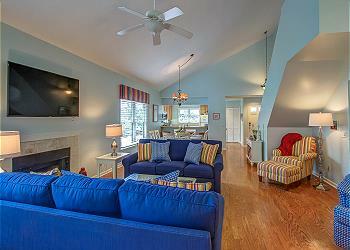 Great location, spacious bedrooms, great screened porch!